If you want to dress up like a character from the other side of the Looking Glass, consider wearing an Alice in Wonderland caterpillar costume. Whether you try your crafty hand at a homemade design, or play it safe with a store bought Alice in Wonderland caterpillar suit, one thing is for certain- you'll be the most eccentric insect in the room! While an Alice in Wonderland caterpillar costume is one of the trickier costume ideas to create, you can have success if you plan ahead and get creative. Let these ideas inspire you and see how you can modify a basic costume pattern into a quirky caterpillar with a little bit of brainstorming. While a quick suit can be pieced together with very little sewing skills, a more elaborate caterpillar costume would benefit from a pattern of some sort. Before you get the scissors out, stop by your local fabric and craft retailer and flip through the pattern books. Chances are you may find an edible or fruit theme costume pattern than will work perfectly for a caterpillar suit. You'll want to be on the lookout for a long silhouette that gently hugs the belly and tapers at the top and the bottom. Be sure to check for string bean, bananas, or snow pea patterns and compromise as needed. In a jiffy, nearly any bodied costume will work with modifications, including a dog or other animal. Once you've create a long swath of fabric from the top of your head to the bottom of your feet, you can move forward and begin affixing colored felt shapes to resemble hands and booties. Use the white felt to cut out 6 gloved hands, and use the yellow felt to create 3 pairs of caterpillar booties. Affix the felt hands and feet to the body of your caterpillar suit. A beanie hat in the same shade of blue can serve as a head covering. For this simple caterpillar costume, cut out a large piece of cardboard and create six arms and six legs. Paint the back of the cardboard the same shade of blue as your sweat suit, and affix the felt cutouts onto the back of the cardboard. Punch holes in the boarding and pull rope or heavy twine through the openings. Tie the ends together and wear the piece on your back and let the arms and legs dangle. If you prefer, you can can purchase a ready-made costume instead of making your own. Visit the following websites and check out all of the wonderful caterpillar suits available in a range of prices and sizes from infant through adult. 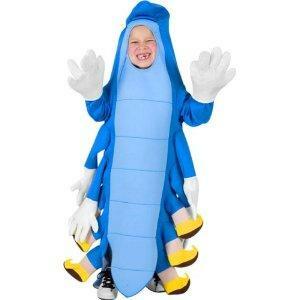 You're sure to be the talk of the party when you dress up like the caterpillar from Alice in Wonderland. Whether you are wearing a costume that you crafted yourself or if you are dressed in a store-bought outfit, be prepared to be the center of attention!